It was once said by a noble man that the greatest skill in life is to want but little; I couldn't disagree more. The greatest skill is to want loads of delicious whipped cream. Immerse the cream between layers of pastry; dump it on pie; pour it atop a sundae. 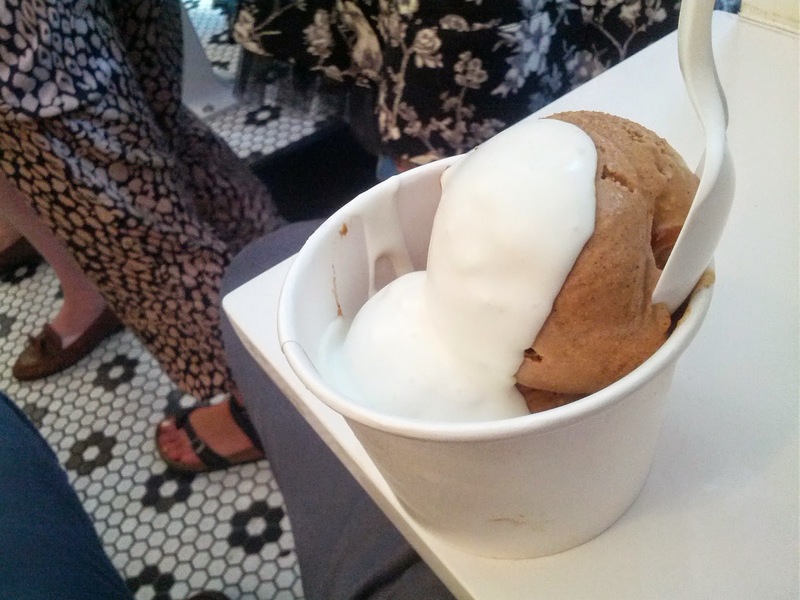 Speaking of sundaes, a new ice cream parlour has opened up in New York on the Lower East Side. It's called Morgenstern's, and it's been mentioned in these chronicles. My first visit was a disappointment, because I had read they made their whipped cream in a special manner which I assumed would result in a voluptuous, pillowy whip -- and if you read the coverage you might have assumed the same (see here). Well my first experience with this "whipped cream" was more like an experience of "foamed cream." The ice cream was respectable and Morgenstern's was new, so I wanted to give her another chance. Yesterday I returned and again ordered an ice cream with a topping of whipped cream. It was exactly the same, only this time I noticed that the liquidy "cream" hardened almost into an icing. Some people might find that cool or good, but for a man who wants nothing but delicious mounds of fluffy cream, I was again disappointed. The ice cream at Morgenstern's is good enough, but please stop calling your "whipped cream" whipped cream. I generally do not place pictures within my chronicles, but felt the need to prove how unwhipped-like the cream is at Morgenstern's. As you can see, the whiteness atop my coffee ice cream is more like thick foam than a whipped cream. It has no fluffiness and simply runs down the sides of the ice cream as if it were a vanilla sauce.